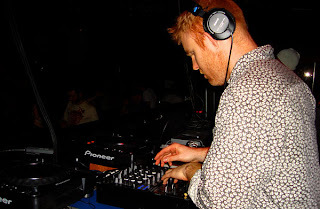 ::: Off the Radar :::: HERCULES & LOVE AFFAIR DJ SET @ BAMBY SATURDAY!!! 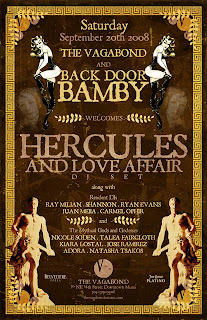 HERCULES & LOVE AFFAIR DJ SET @ BAMBY SATURDAY!!! Been anxiously waiting for Hercules & Love Affair (DFA) to come to Miami and the day is almost upon us! This Saturday, 9/20 Andy Butler the genious behind Hercules & Love Affair comes to MIA to rock Back Door Bamby/The Vagabond and Miami in general! In the buzzing nu-disco scene that has been taking hold this year (particularly in NYC) Hercules & Love Affair have arguably had the biggest crossover success with the release of their critically acclaimed self titled debut, and by signing to DFA have only helped their cause. With DFA behind them they have extra help, push and credibility, especially if they keep making blistering hits like 'Blind' which has to be one of the most memorable tracks to come out this year! It all goes down this Saturday 9/20 @ The Vagabond for their weekly Back Door Bamby party were I also happen to be a Resident ;) If you live in Miami you already know were the Vagabond is. If you live somewhere nearby (Orlando, Tampa, Gainesville, etc) this may be a good time for a week-end visit to MIA! Buy your advance tixs at a discounted price @ www.wantickets.com. I'll be doing an Opening Set to warm up the crowd that night. Hope to see there! Also related here's a Modeselektor Remix off of Bjork's last album that featured Antony Hegarty who pulls vocal duties on many Hercules tracks, including 'Blind'. Mode did 2 remixes, a Girls and a Boys one. I liked this Girls remix better.